Dont let yourself grow cold..."
The past weeks have seen me often out in the cold, well before dawn, to work on a few remarkable photographic opportunities. I wanted to write about eagles, vultures, rock partridges, foxes and all the nice animals that somehow shared their life with me. But there is a more urgent and unpleasant matter to report. 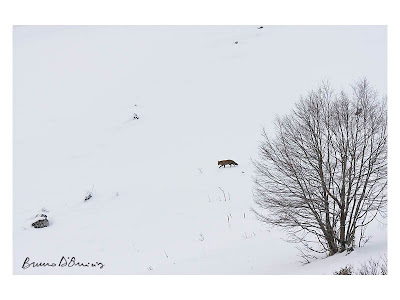 A few days ago, an Italian senator, Mr. Franco Orsi belonging to the governing party PdL, came out with an ominous law proposal which plans to completely change the hunting rules and therefore affect the destiny of the wildlife in Italy. Among the many wicked points of this law are the opening of hunting in the national parks and nature preserves and that of the hunting of "pests" such as wolves, bears, swans and many other rare and protected species. For more information (only in Italian, unfortunately), you can visit this webpage and sign the petition here. If you would like to get more information in English, please feel free to write me as I would be eager to spread the word about this horror. Unfortunately this is not an isolated case. This is just one of the many horrible things I see happening everyday here in Italy (or elsewhere) against nature and against people. One of the many attempts to limit our freedom and the one of whom cannot speak. Today, I can still retreat in my hermitage of mountains and old beech forests, smelling the silence of the snow and waiting for a fox to appear in the morning. But for how long? Oh my word, oh my word!!! Bruno.. I am shocked!! But that is exactly why you are doing Wild Wonders of Europe. To change people's attitudes. To open their eyes to this incredible heritage. To make them FEEL something for nature so that they will vote against such archaic and ignorant policies.